The latest US consumer inflation figures further dampened prospects for an aggressive Fed rate hike moves. This coupled with Rex Tillerson's exit as the US Secretary of State led to a sharp US Dollar sell-off and assisted the GBP/USD pair to break through an important supply zone near the 1.3910-20 region. The British Pound was further supported by the spring statement, in which the UK's 2018 GDP growth forecast was revised up to 1.5%. Meanwhile, the US President Donald Trump's plan to impose tariffs on China continued exerting downward pressure on the greenback through the Asian session on Wednesday, with the pair inching closer to the key 1.40 psychological mark. In absence of any major market moving economic releases from the UK, the USD price dynamics should continue to act as an exclusive driver of the pair's momentum through the European session. Later in the day, the US monthly retail sales data, along with the latest PPI figures would influence sentiment surrounding the already struggling USD and provide some fresh impetus. 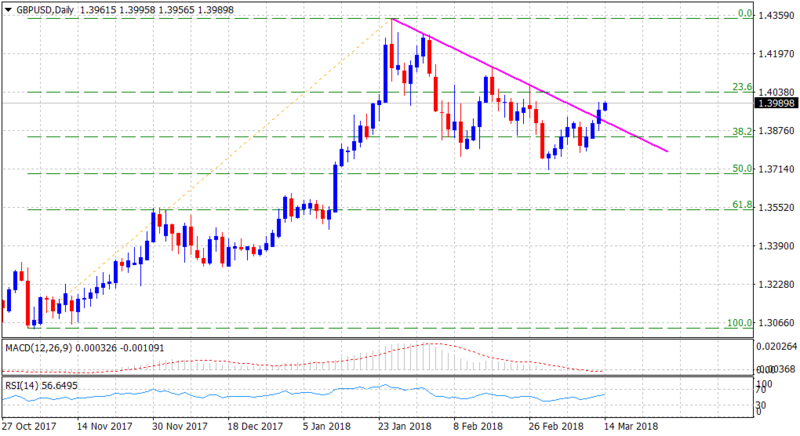 From a technical perspective, Tuesday's strong up-move marked a bullish break above a short-term descending trend-line resistance and hence, the pair remains poised to extend the momentum towards the 1.4030-40 resistance, representing 23.6% Fibonacci retracement level of the 1.3039-1.4345 upsurge. A follow-through buying interest has the potential to continue boosting the pair further towards reclaiming the 1.4100 round figure mark. On the flip side, 1.3960 level now seems to protect the immediate downside, which if broken might prompt some additional long-unwinding trade. However, any subsequent weakness is likely to find some fresh buying interest around the descending trend-line resistance break area, now turned strong support, near the 1.3900 handle.